This was the natural and proper end of Napoleon’s career. So this raid of an intolerable egoist across the disordered beginnings of a new time should have closed. At last he was suppressed. And had there been any real wisdom in the conduct of human affairs, we should now have to tell of the concentration of human science and will upon the task his treachery and vanity had interrupted, the task of building up a world system of justice and free effort in the place of the bankrupt ancient order. But we have to tell of nothing of the sort. Science and wisdom were conspicuously absent from the great council of the Allies. Came the vague humanitarianism and dreamy vanity of the Tsar Alexander, came the shaken Habsburgs of Austria, the resentful Hohenzollerns, of Prussia, the aristocratic traditions of Britain, still badly frightened by the revolution and its conscience all awry with stolen commons and sweated factory children. No peoples came to the Congress, but only monarchs and foreign ministers; and though you bray a foreign office in the bloodiest of war mortars, yet will its diplomatic habits not depart from it. The Congress had hardly assembled before the diplomatists set to work making secret bargains and treaties behind each other’s backs. Nothing could exceed the pompous triviality of the Congress, which gathered at Vienna after a magnificent ceremonial visit of the allied sovereigns to London. The social side of the Congress was very strong, pretty ladies abounded, there was a galaxy of stars and uniforms, endless dinners and balls, a mighty flow of bright anecdotes and sparkling wit. Whether the two million dead men upon the battlefields laughed at the jokes, admired the assemblies, and marveled at the diplomatists, is beyond our knowledge. It is to be hoped their poor wraiths got something out of the display. The brightest spirit of the gathering was a certain Talleyrand, one of Napoleon’s princes, a very brilliant; man indeed, who had been a pro-revolutionary cleric, who had proposed the revolutionary confiscation of the church estates, and who was now for bringing back the Bourbons. The allies, after the fashion of Peace Congresses, frittered away precious time in more and more, rapacious disputes; the Bourbons returned to France. Back came all the remainder of the emigres with them, eager for restitution and revenge. One great egotism had been swept aside only to reveal a crowd of meaner egotists. The new king was the brother of Louis XVI; he had taken the title of Louis XVIII very eagerly so soon as he learnt that his little nephew (Louis XVII) was dead in the Temple. He was gouty and clumsy, not perhaps ill disposed, but the symbol of the ancient system; all that was new in France felt the heavy threat of reaction that came with him. This was no liberation, only a new tyranny, heavy and inglorious tyranny instead of an active and splendid one. Was there no hope for France but this? The Bourbons showed particular malice against the veterans of the Grand Army, and France was now full of returned prisoners of war, who found themselves under a, cloud. Napoleon had been packed off to a little consolation empire of his own, upon the island of Elba. He was still to be called Emperor and keep a certain state. The chivalry or whim of Alexander had insisted upon this treatment of his fallen rival. The Habsburgs, who had toadied to his success, had taken away his Habsburg empress she went willingly enough to Vienna, and he never saw her again. After eleven months at Elba Napoleon judged that France had had enough of the Bourbons; he contrived to evade the British ships that watched his island, and reappeared at Cannes in France for his last gamble against fate. His progress to Paris was a triumphal procession; he walked on white Bourbon cockades. For a hundred days, «the Hundred Days», he was master of France again. He gathered an army, he made some attempts at peace with the allies; when be found these efforts ineffectual, he struck swiftly at the British, Dutch, and Prussians in Belgium, hoping to defeat them before the Austrians and Russians could come up. He did very nearly manage this. He beat the Prussians at Ligny, but not; sufficiently; and then he was hopelessly defeated by the tenacity of the British under Wellington at Waterloo (1815), the Prussians, under Blucher, coming in on his right flank as the day wore on. 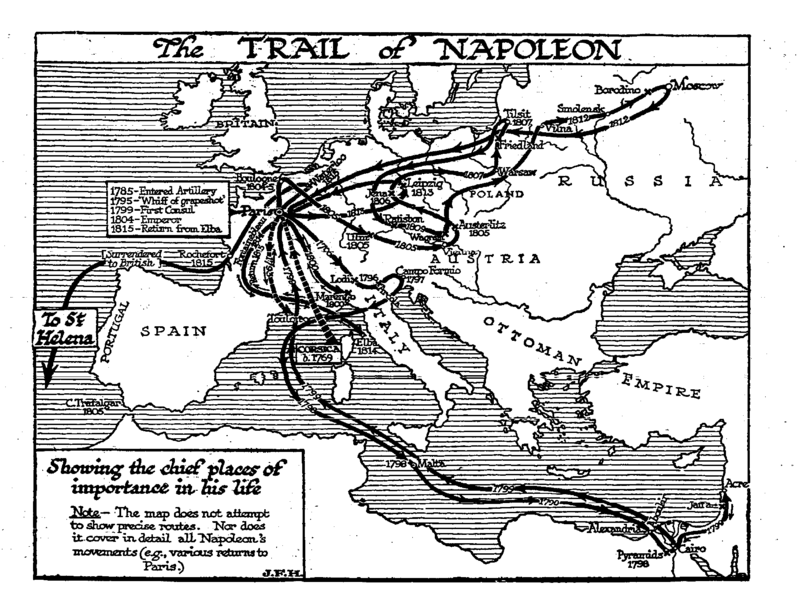 Waterloo ended in a rout; it left Napoleon without support and without hope. France fell away from him again. Everyone who had joined him was eager now to attack him, and so efface that error. A provisional government in Paris ordered him to leave the country; was for giving him twenty-four hours to do it in. He tried to get to America, but Rochefort, which he reached, was watched by British cruisers. France, now disillusioned and uncomfortably royalist again, was hot in pursuit of him. He went aboard a British frigate, the Bellerophon, asking to be received as a refugee, but being treated as a prisoner. He was taken to Plymouth, and from Plymouth straight to the lonely tropical island of St. Helena. There he remained until his death from cancer in 1821, devoting himself chiefly to the preparation of his memoirs, which were designed to exhibit the chief events of his life in a misleading, and attractive light and to minimize his worst blunders. One or two of the men with him recorded his conversations and get down their impressions of him. These works had a great vogue, in France and Europe. The Holy Alliance of the monarchs of Russia, Austria, and Prussia (to which other monarchs were invited to adhere) labored under the delusion that in defeating Napoleon they had defeated the Revolution, turned back the clock of fate, and restored Grand Monarchy on a sanctified basis for evermore. The cardinal document of the scheme of the Holy Alliance is said to have been drawn up under the inspiration of the Baroness von Krudener, who seems to have been a sort of spiritual director to the Russian emperor. It opened, «In the name of the Most Holy and Indivisible Trinity», and it bound the participating monarchs «regarding themselves towards their subjects and armies as fathers of families», and «considering each other as fellow-countrymen», to sustain each other protect true religion, and urge their subjects to strengthen and exercise themselves in Christian duties. Christ, it was declared, was the real king of all Christian peoples, a very Merovingian king, one may remark, with these reigning sovereigns as his mayors of the palace. The British king had no power to sign this document, the pope and the sultan were not asked; the rest of the European monarchs, including the king of France, adhered. But the king of Poland did not sign because there was no king in Poland; Alexander, in a mood of pious abstraction, was sitting on the greater part of Poland. The Holy Alliance never became an actual legal alliance of states; it gave place to it real league of nations, the Concert of Europe, which France joined in 1818, and from which Britain withdrew in 1822. There followed a period of peace and dull oppression in Europe over which Alexander brooded in attitudes of orthodoxy, piety, and unquenchable self-satisfaction many people in those hopeless days were disposed to regard even Napoleon with charity, and to accept his claim that in some inexplicable way he had, in asserting himself, been asserting the revolution and France. A cult of him as of something mystically heroic grew up after his death.